I completed my project 365. It was a fun project, but I don't think I'm going to do it again! It's so nice to not HAVE to take a picture every day. I have a few ideas for some future ongoing photo projects, so stay tuned. Alex is becoming very active, and it's hard to keep up with him some days. Older kids with their tiny toys and babies do not make a very good combination. Thankfully, Alex will now spit out whatever he puts in his mouth when I tell him, "spit it out." But, we really have to watch him like a hawk ... and keep the floors clean! One day he found an m&m ... he was a little bit reluctant to give that up! He had the green candy shell sucked off and was down to about half of the chocolate. 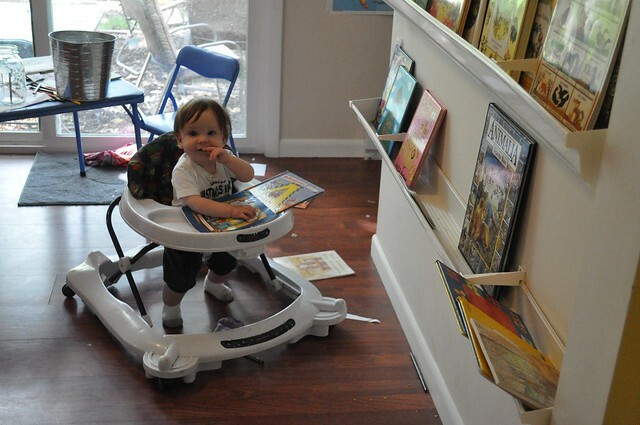 Alex pulling all the books off the shelf. Alex is pulling up now! 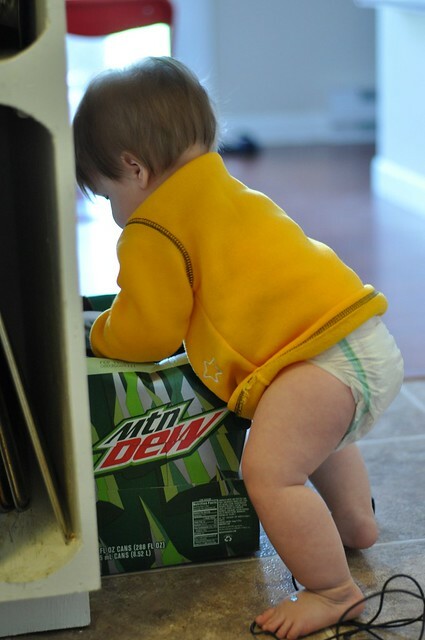 He's having a little trouble here, because the mountain dew case was half empty, so the top kept collapsing in on him. He was able to keep himself up, though! I got a new lens for my birthday (50 mm, 1.8), but I haven't had too much of a chance to try it out. From what I've seen, I do think I'll be able to get better pictures inside this winter with it. Time will tell. 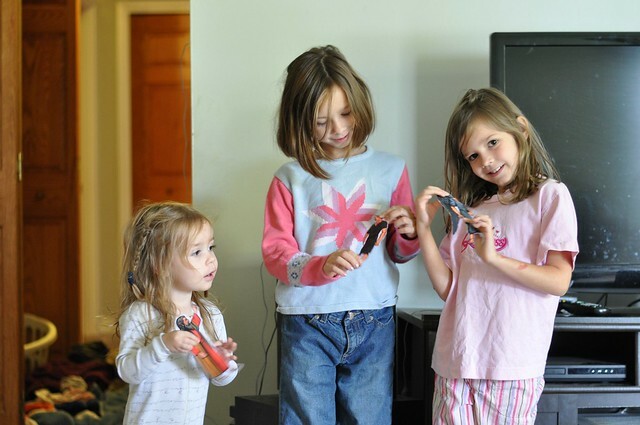 The girls giving me a chance to try out my new lens ... posing with bible felts they were playing with. Try to ignore Mount Laundry in the background, LOL. Sarah likes to enjoy every last drop of water in her bath. After all the water had gone down the drain, I tossed her the towel. 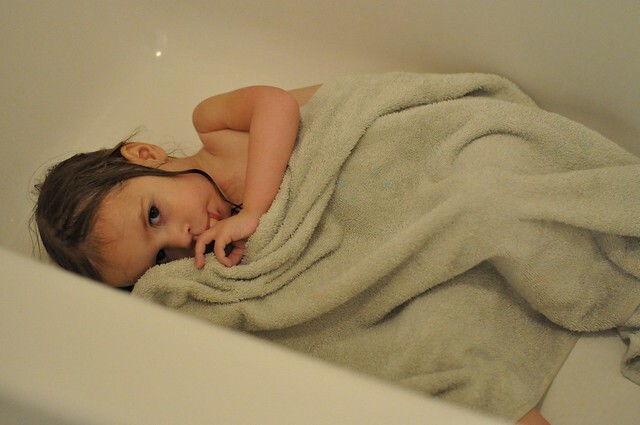 She curled up with it like a blanket, and just laid in the bottom of the tub. She is so funny sometimes! 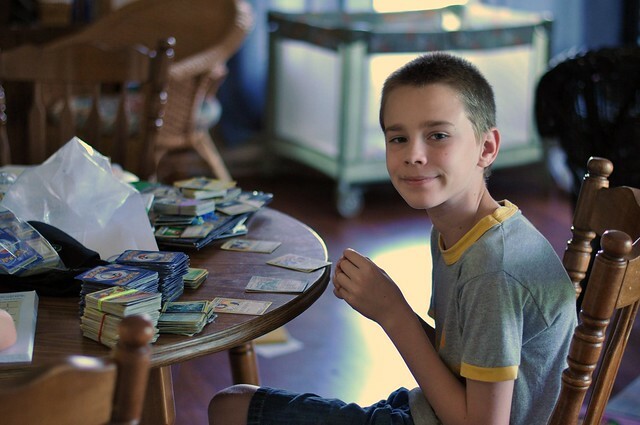 Caleb with his Pokemon cards. 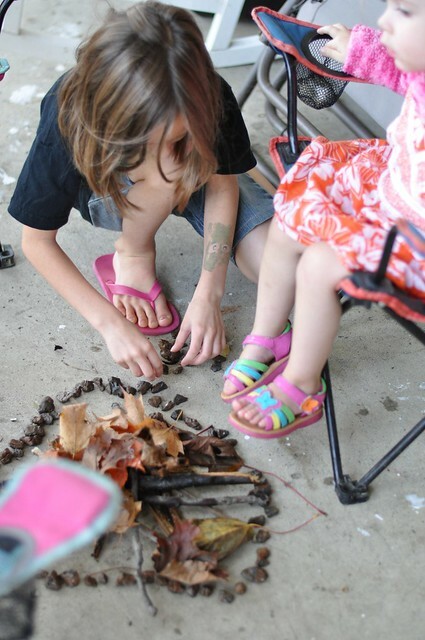 The girls building a 'campfire' on the front porch. It was raining this day, so I told them they could play outside if they stayed on the porch. They obviously listen well!